Discussion in 'Micro 4/3 News and Rumors' started by Phil Rudin, Jan 2, 2011. News on the EPL-2 which should be shown on Jan 6, with the improved 14-42 kit lens. It appears that a new underwater housing will be announced at the same time. Olympus has heard the comments about the size of the PT-EP01 housing and has clearly shrunk the new housing to remove the EVF area. This housing appears to use the same stock port, keep your fingers crossed that will allow crossover to the outstanding ZENUNDERWATER.com dome ports. The Olympus xz1 is also getting a housing of it own. That could be very awesome! I use a Nikonos, but I'd love to have an underwater digital camera some day, but I'll have to cobble it all together over time. This is my review on the current EPL-1 housing with photos, it is a great system and the new housing and camera should ot even better. 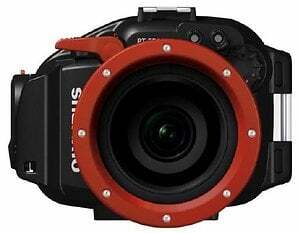 Cost for camera and housing should run around US $1100.00.